Facebook's Candace Zhu at work. 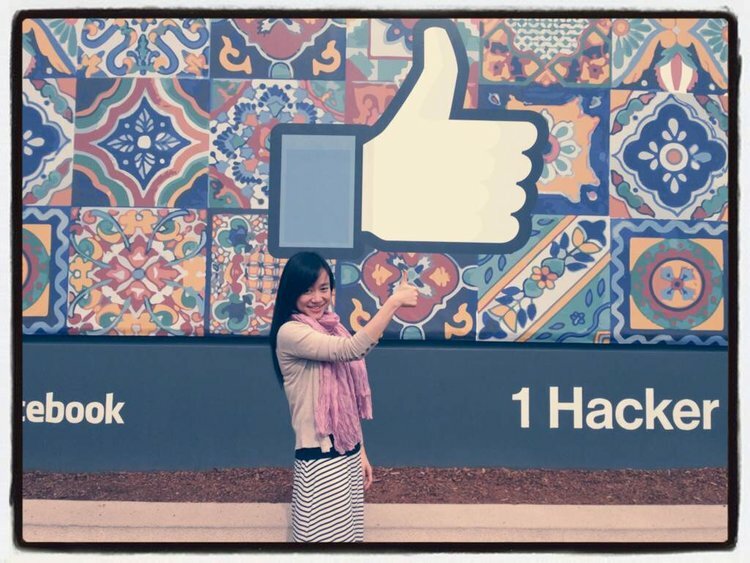 When Candace Zhu first applied to work at Facebook as a software engineer, she was rejected. She had interviewed well, but it was decided that she wasn't a great match for the role — she originally went to college for business, and only picked up programming later in life through community college classes and online learning. By contrast, many Facebook employees hold technical degrees from top schools like UC Berkeley or Stanford. Fortunately for Zhu, Facebook's recruiters flagged her as a candidate for a new program at Facebook: The Rotational Engineering Program, a year-long initiative that's designed to get people from non-traditional tech backgrounds like Zhu the skills they need to get hired into a full-time role at the social network. And so, back in December 2016, Zhu and 34 others started at Facebook as the first batch of the Rotational Engineering program. Members of the program work alongside full-time Facebook engineers, contributing code to the social network and its array of services. The only major difference is that they receive extra mentorship from the leader of their team. After six months, they move to another team. And yes, they get full pay and the same benefits as full-time employees. Now, Zhu is embedded with the Facebook smartphone app team, picking up skills that will ideally make her a stronger candidate for the original role in which she interviewed. "Of course," she wants to stay at Facebook, Zhu told Business Insider, but she says that what she's learning would give her an edge anywhere. "I can go anywhere and use these skills," Zhu said. "I grew so much in this time." Facebook Engineering Director Nimrod Hoofien, the rotational program's internal sponsor, said that introducing the program to Facebook's engineering teams was "nerve-wracking." There was no way to tell how they would react. Within two hours, though, he had 60 Facebook engineering teams willing to participate. Facebook isn't the only one taking a crack at this, with companies like LinkedIn offering similar programs. But where those existing programs tend to focus on picking up fresh graduates from coding "bootcamps" like the nine-week Dev Bootcamp program, Facebook is aiming to take a broader approach. There are lots of people who are either self-taught, or who came to programming later in life. Many of them are from disadvantaged or otherwise underrepresented groups, and they may never have picked up the skills or experience that Facebook is looking for. And yet, just by taking those first steps into the world of tech, they've demonstrated real drive, Hoofien said. "There are cases where we see huge growth potential, despite the fact that the candidate's current skills aren't exactly where we would like them to be," Hoofien said. A little over six months in, this is still very much an experiment for Facebook. So far, so good, according to Hoofien. Members of the rotational program have so far contributed to updates to internal software like Facebook's GraphQL database tool, as well as the Ad Manager app for Facebook advertisers. "All of them are doing pretty damn well," Hoofien said. "People perform highly, and have high impact." Silicon Valley companies have long been criticized for mainly hiring people who meet a certain profile — predominantly straight, white men who went to an Ivy League or otherwise prestigious school. It's led to a huge problem where women, people of color, and other groups are underrepresented in the tech industry. Meanwhile, Facebook has renewed its efforts to hire more diverse candidates, even as it comes under constant fire for its slow progress. And while Hoofien acknowledged that the Rotational Engineering Program isn't a magic bullet, he said that it has an important role to play, bringing in people Facebook might otherwise have missed. Intriguingly, Hoofien said the biggest "blocker" to this program that many people who qualify are really nervous to take the plunge. Because they don't match the traditional "profile" of a Facebook employee, it's a challenge to convince these candidates that they might belong at Facebook. "Getting people to believe in themselves is a big deal," Hoofien said. For her part, Zhu had a simple answer when asked if she was nervous to start at Facebook: "No." Zhu said she was excited to get started, and that she's experienced great support from the Facebook engineers with whom she's been working. At one point, she said, her whole team stayed with her until 9 p.m. so they could solve a problem. "I feel this mentorship is very special," says Zhu.